Adventurer physically weighs every camper at the end of their production line and writes that exact weight on every unit and records it in a factory log. We have witnessed this routine in action at the Adventurer Manufacturing factory on two separate occasions (in 2010 and 2015). 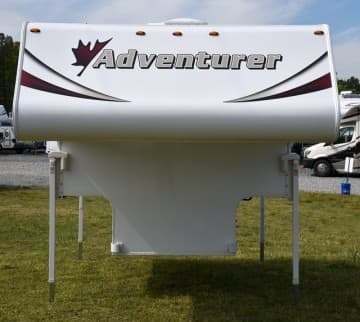 Adventurer lists the dry weight of the Adventurer 80RB at 1,757 pounds. Due to the above mentioned practice, we are extremely comfortable with the accuracy of this weight. That said, the 1,757 pound dry weight represents a base camper that would have to be special ordered by a customer. Nearly every dealer-ordered 80RB comes with a list of popular standard-build options. 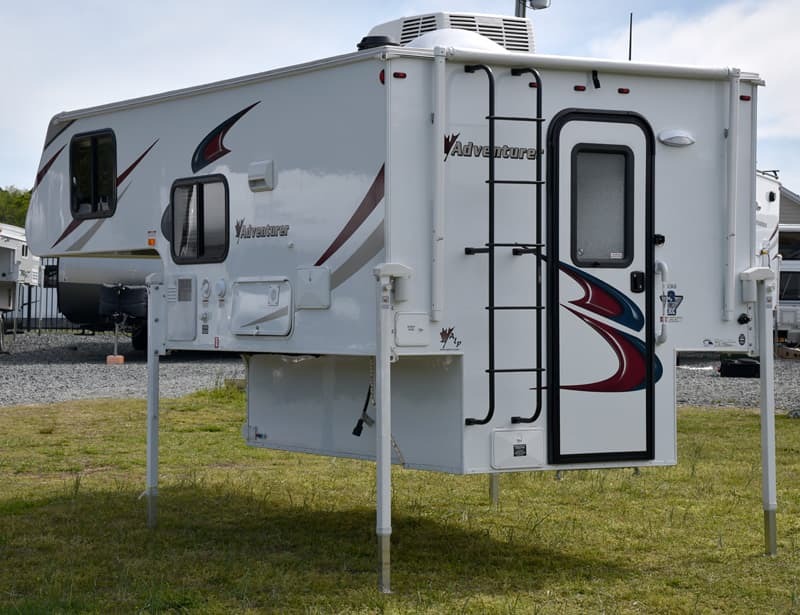 For the 80RB, the standard build options are a rear awning (22 pounds), the Camper Caddy (3 pounds), and the AM/FM/CD/DVD/Bluetooth stereo system (8 pounds). These standard build options bring the dry weight of the 80RB to 1,790 pounds. 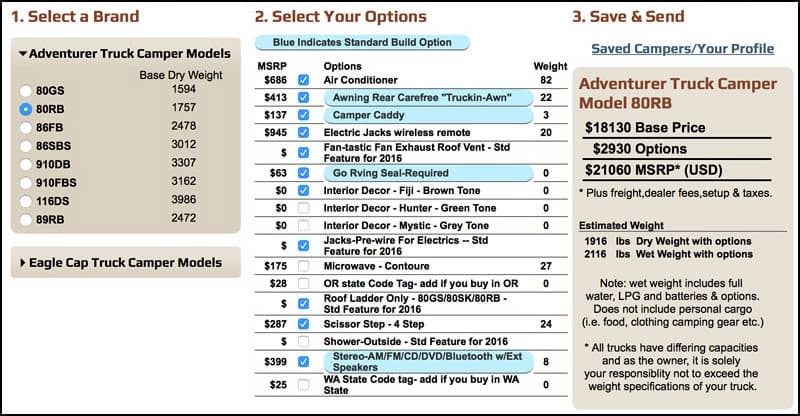 To find the actual dry weight with options of the 80RB under review, we used Adventurer’s online Build Your Own system. 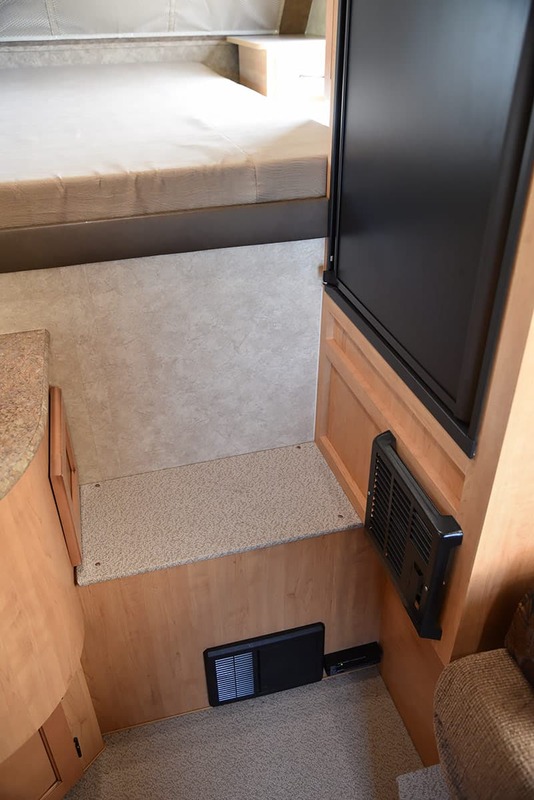 Using the system, we added the options found on the 80RB under review including an air conditioner (82 pounds), awning (22 pounds), Camper Caddy (3 pounds), electric jack remote upgrade kit (20 pounds), and AM/FM/CD/DVD/Bluetooth stereo system (8 pounds). We also added the optional 4-step scissor step system (24 pounds) as nearly every 80RB will require it. Above: The dry weight of the Adventurer 80RB under review was calculated using the Adventurer’s Build Your Own system. This screen capture above shows the results. With the addition of these options, the final dry weight of the 80RB under review was 1,916 pounds, an increase of 159 pounds over the base dry weight. 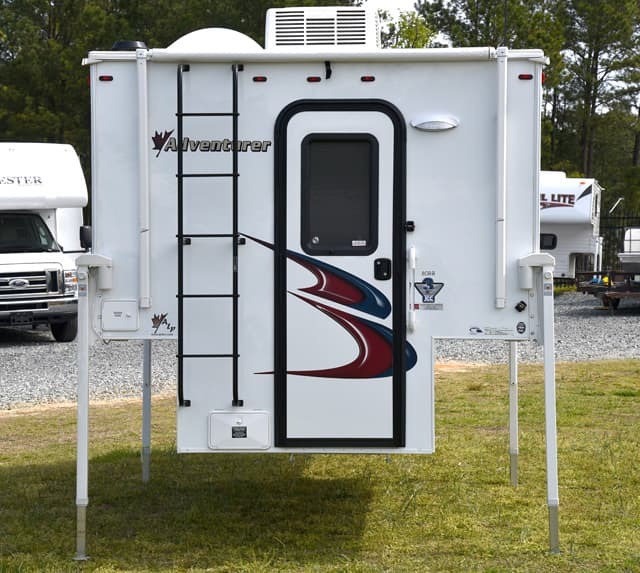 Even though the 80RB is a 5.5-foot super-short bed compatible unit, the remaining specifications (camper width and height) are close to full-size, or better. 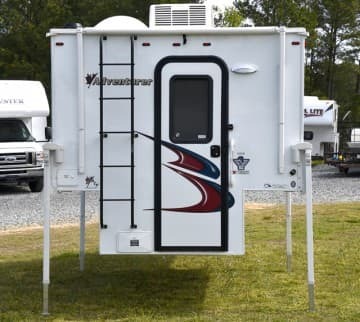 The width is 90-inches, about 6-inches narrower than Adventurer’s larger units. If I had to guess, I would say this is yet another way the Adventurer team kept the weight down. 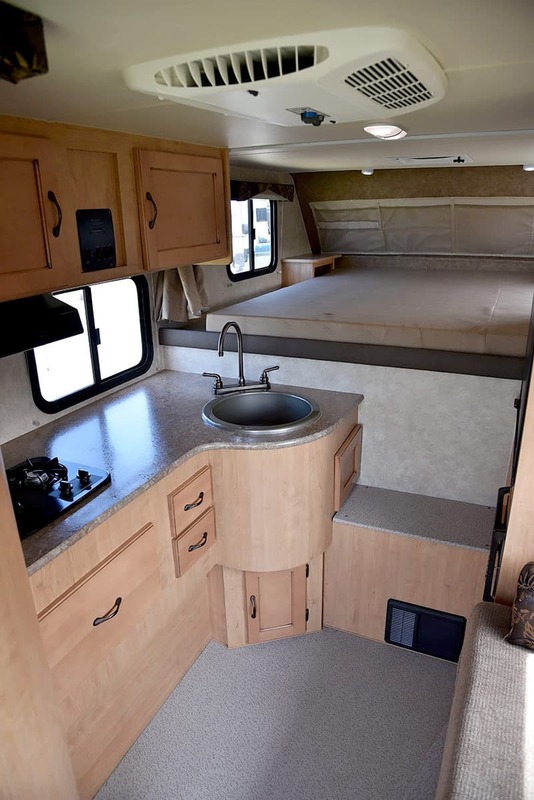 With truck campers, every inch of floor length and width costs weight. The interior height is 80 5/8-inches, which is actually 2-inches taller than Adventurer’s larger units. Looking the design, it’s probably a smart bet that the refrigerator caused this higher roof anomaly. I stand over 6-feet tall, so the additional ceiling height would be appreciated, especially for standing where the optional air conditioner is installed. At 27.5-inches, the center of gravity seems to good to be true. Using the modern CAD, materials, and appliance choices mentioned earlier, Adventurer really hit the COG mark. The result should be impressive handing and control on properly matched rigs.